Little Dolls To Brighten The Day! I love the patterns made by GingerMelon. They seem simple, and they are, but it's the quality of the pattern drafting that makes them so easy and enjoyable to make. She's figured out all of the little details (pun intended, but also necessary) to make a little doll that won't fall apart on you, and also won't make you start cursing existence when you go to sew them. Add to it they are made of felt, one of the most awesome fabrics to work with when you want minimal fuss with your sewing, and it's about as close to perfection in doll making as you can get for me. I have purchased several of her patterns over the last few years, and enjoy making them all. I've made a few for gifts for others, but tend to keep a lot of these for myself, which is unusual. There's something about the sweet faces and colorful felt that makes me smile. 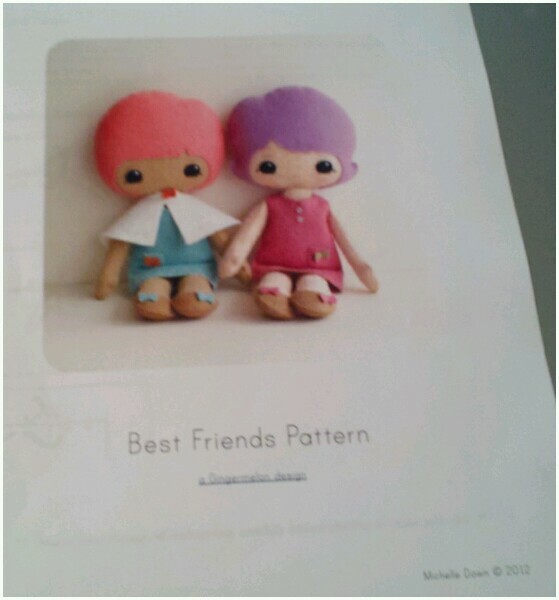 The latest pattern I have purchased from her is her Best Friends dolls, including the cute clothing sets she designed to go with them. Another set of fairly small dolls, so they have a lot of tiny, tiny parts, but again, it's felt, so it's easy to work with. As long as you get high quality felt, with a high wool content, you're set. These dolls definitely should not be made out of the "four for a dollar" polyester felt you can buy in general stores. The fabric needs to have wool so it can withstand being stuffed firmly, and not stretch out. Plus, the cheap polyester gets stringy when I work with it. A good quality wool blend felt yields to my sharp little embroidery snips with nice clean cuts. Lately I've been swamped with work and life in general, as evidenced by my lack of posting anything here. When I get overwhelmed with it all, I turn to dolls. I enjoy playing with my fashion dolls ('cuz I'm an adult, or something), but to get my nerves back on an even keel I need to make something with my own two hands. And when my brain is frizzled from everything else, it's nice to have a reliable pattern to turn to that lets me be creative, but has done the "heavy lifting" on the logistics of construction already. I highly recommend Gingermelon's patterns. They may seem pricey in the world of .99 items, but the quality of the pattern drafting, the detailed instructions, and fantastic customer service is worth every penny. She also encourages people to sell what they make from her patterns in their home (as long as you give her credit for the pattern, of course!). Check out her Facebook page, and you'll see I'm definitely not the only one who is a huge fan of her patterns. She also has terrific paper dolls you can purchase for download, to color and cut out as many times as you like. I have the bodies and outfits for what I'm sure will be only the first pair of "best friend" dolls I'll be making. Now I just need to be patient and get through the day job and other chores so I can have a spare hour before bedtime to work on them again! Above is the front page of the pattern. There are several pages of instructions included. A closeup on the little dresses, cape, and shoes cut out. See those tiny little bows? Thank goodness they're out of felt! A closeup on the heads with their funky colored hair. Older PostA New Obsession Begins!